I received my mid-length kit from Del-Ton yesterday and have to say the quality of what I received was way above what I expected. Additionally the Essential Arms lower was perfect as well. I had made a cursory inspection and things looked good, but when putting the LPK into the lower I discovered how good it really was. The fit and finish was flawless, there was no filing, grinding, reaming, or adjusting necessary. Total time it took to put everything together was around 2 hours including gathering the tools I would need. I was prepared to get a punch set, detent installation tool, vice block and all the other stuff that is recommended; I didn’t and was able to get it together with little or no drama. I followed the guide on AR15.com With the exception of the Cal compliant bullet button it was step for step easy to follow. The Bullet Button was actually easier to install than the standard mag release so there was no drama there. Below is a step by step summary. A hammer – I used an adjustable face mallet I got at Harbor Freight for $4 with a coupon, it has four different faces that can be used in varying hardness, for the most part I used the hardest plastic face and the metal face. This was used in place of the roll-pin punches, it has tapered tips that fit nicely into the roll pins and worked very well. A hemostat – basically a small locking clamp. Harbor Freight carries them but you can also pick them up anywhere small tools are sold. This was extremely helpful when installing the small detent pins. Locking pliers (Vice Grip®) – I used a set of needle nose locking pliers but pretty much any configuration will work as long as it can open larger than 1”. The larger you use the more leverage you have, but don’t go over about 10”. The pliers were used to press in the roll pin when installing the mag catch release and the trigger guard. VERY helpful. Small flat piece of metal – I used a small screwdriver that I had ground flat, but a small metal ruler or other thin flat piece of metal will work. This is to hold the front takedown pin detent down while inserting the pin. A tool is available for this purpose, but unless you are building multiple lowers it isn’t worth it. ¼” hardwood dowel or metal rod – used in the installation of that pesky front take down pin, holds the detent down while you push in the pin. Large clear plastic bag – I used a 1 gallon ziplock bag to put over the lower while installing the front take down pin to keep the detent contained when it launches (yes it will). Electrical tape – protects the metal parts from scratches. Overall, the build is very simple and only requires a few cheap tools. Make sure you tape up the lower and the locking pliers to keep from scratching things up and things will go fine. There are a couple difficult steps that take some time and finesse; the bolt catch release and the front take down pin. FIRST, TAPE UP YOUR LOWER SO YOU DON’T SCRATCH IT!!! NEXT, TAPE UP YOUR PLIERS SO YOU DON’T SCRATCH YOUR LOWER. Put a small amount of lube on the end of the roll pin and if necessary you can squeeze the end down a little. Using your hemostat or small needle nose pliers line the pin up with the hole and squeeze it in a little using your locking pliers. DO NOT PUSH THE PIN IN MORE THAN A COUPLE MILILMETERS. Insert the spring and buffer, line up the release and carefully squeeze the pin in the rest of the way. You may need to tap the pin in to seat it fully, but by then the hard part is done. DO NOT LET THE DETENT LAUNCH ACROSS THE ROOM. WHILE COMPRESSING THE SPRING PUT THE BAG OVER THE RECEIVER AND WORK INSIDE THE BAG. The technique I used was to insert the 1/4” rod into the holes from the left side of the receiver, then gripping the detent with the hemostats, guide it into the hole compressing the spring as far as I could. Using the rod and flat piece of metal together press the detent down and the rod forward until it is held down by the rod. Finally, carefully press the rod out with the takedown pin allowing the detent to transfer over to the pin. If you get this the first time you are amazing, it took me about five times to get things lined up right, but when it worked it went smooth. Everything else is cake and with a little patience should be easy. There are many other hints out there, read all of them, take notes, and have fun. My build took all of about 1 hour and when it was done I was left thinking “that’s it?”. So here we are, well into week 17 of waiting on my order from Del-Ton. I am going to be in Pascagoula, MS next week, so of course, my upper will get here then. Total I will have $700 invested with about another $100 for "dig-me" items NOT counting ammo...not bad considering it would cost me ~$1500 for the same rifle plus all the California fees and such. Yesterday I ordered my open sights. 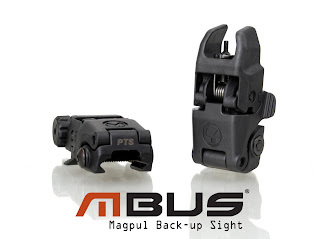 I got MagPul Back-up Sights (MBUS), front and rear sights from machineguntours.com for $85 shipped - about $15 cheaper than any other site I found. I received the Prince50 Bullet Button and Action Wrench a couple of weeks ago, talk about good quality - I am impressed. The magazine that also came is really nice. I can't wait to get going on this build and get the kit in the mail from Del-Ton. Yes, I have jumped on the band-wagon, been swept up in the hype, and been bitten by the gun-grab panic bug. The media craze has prompted me to quit procrastinating and purchase a firearm I have been in love with since I first fired it in Ft. Leonard Wood, MO in 1995. I decided to go the "build your own" route due to the $$ savings and the ability to get what I want without paying for what I don't. I have also ordered a 16" mid-length Rifle Kit from Del-ton (www.delton.com) and am in the waiting pattern. As the days drag on I will keep this updated with the progress and associated costs.